To download and modify this cross-functional map, see the Drawing Instructions below. 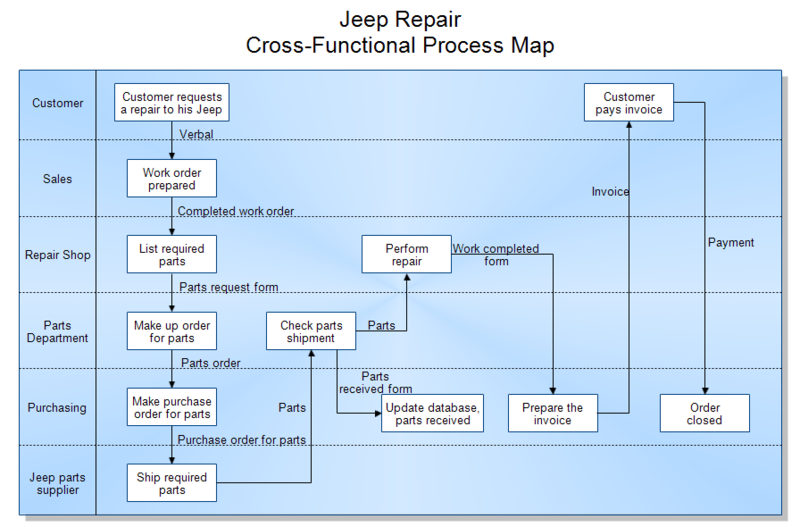 The above cross-functional map shows the steps when a customer decides to have her Jeep repaired. Several departments are involved before the repair is completed and paid for. The white boxes show what each department did during that step. The lines show the inputs and outputs. These inputs and outputs may be documents, purchase orders, invoices, or physical parts. In a cross-functional map the customer, departments and external companies are listed on the left. They are separated by dotted lines so it is easy to see which department does which step. The dotted lines look like the swim lanes in a pool and some people refer to these as swim lane charts. The steps are connected by arrows to show the order the steps are performed. The flow is generally from left to right. The lines are labeled with the input or output of each step. Double-click on the words Customer, Sales, etc and replace them with the departments or groups you are interested in. Connect these boxes with lines. You can add new lines from the stencil at the left if you want. Double-click each line and label it with the actual input or output for your process steps.